Joining a gym is definitely a step in the right direction for your fitness goals. Say goodbye to that cramped space you cleared out between your living room and the dining room in the hope you could squeeze in some stretches. Now that you’ve joined a gym, you have professionals to make sure you’re putting in the work like you’re supposed to and you have the costs, which means it’s important you make good use of it if you don’t want to waste your money. It’s a level up from your basic DIY home routines, and we know you are eager to make the most bang out of your buck. The simple answer: take advantage of what you don’t have. We’re talking amenities, freebies, complementary services and most importantly, equipment. If you want to start your new gym life on the right foot (and make certain you stay on the right path), check out these four simple workouts you can do as a first-timer at the gym. Biking is one of the most effective exercise activities for any fitness goal. Not much instructions needed here (except maybe to operate the computer and input the required details), so you can readily hop onto the nearest, unoccupied stationary bike, and pedal on to a healthy body! This workout is easy and sustainable, and works out all your core muscle groups without putting too much stress on the joints and limbs. Putting in 30 minutes (or about 150 minutes a week) on the bike each day should put you on the right track to a healthier body. For your first time, you can break this down into smaller sessions so you don’t tire yourself out too quickly. You can start with three 10-minute sessions, giving yourself some five to ten minutes in between to catch your breath. As you get used to this work out, you can extend each session until you’re doing half an hour in one go. Consider a spin class or group cycling sessions to make the exercise more fun and if you really want to push yourself. The back takes the brunt of many workouts, but few exercises are designed to tone this specific area. Here’s where the lateral pull-downs come in. This workout targets the back muscles, strengthening your body’s support system. To avoid straining yourself, limit this to a two-to-four weekly session instead of a daily activity. First ensure that the weights are actually bearable. Remember, you’re toning your body, so look at your limits rather than someone else’s. Start light then work yourself to heavier weights when you get used to it. Keep your grip slightly wider than shoulder-width, and keep your back straight as you slowly pull the bar to your upper chest area. As you pull, be sure to squeeze your shoulder blades together, and extend your arms fully but carefully. Repeat for about 8 to 12 times per set, and continue until you can comfortably do three sets per session. If you’re uncertain about anything, don’t forget to ask for help from the staff or in-house trainer. It’s easy to workout your lower body muscles (as in every single time you’re walking), so take this time to focus on your upper body as well. The chest press exercise does exactly that, and it’s a good introductory workout to the more rigorous bench press, which works out more muscle groups, but requires greater strength, and poses more risks. The chest press lets you tone your pectorals, while giving your heart a healthy workout. It’s also a good way to exercise your upper body even when you’re experiencing problems with your shoulders and arms. Just be mindful of your limitations, and take care not to press yourself too hard. If you have any cause for concern, have a trainer supervise your exercise. Select the weight you feel most comfortable with (don’t be afraid to start out small!) then sit straight with your back pressed to the back pad. Inhale on the starting position, and exhale as you slowly extend your elbows outwards. Keep your limbs fluids and don’t lock them. Inhale again on this new position, and tuck your arms back in on your exhale. Repeat until you’re comfortable with the set up and work towards heavier weights. If you really want to play it safe and start small, this routine is perfect for you. The bicep curls can strengthen your arms and tone your limbs for more rigorous exercises later on, such as the ones mentioned above. You can start with dumbbells less than 10 kilograms in weight, working for 8-12 repetitions in a set. Begin by holding the weights straight down, palms facing outward. Be sure to maintain a straight posture, with the knees slightly bent for added support, particularly with heavier weights. As you pull up, keep your arms at your sides and slowly raise your fists to shoulder level, lowering them just as carefully. Bicep curls are easy enough, but they can be limited to two to four sessions in a week. Once you’ve toned your arms well, you should have no problem graduating to more difficult exercises that require extensive arm use and lifting. The above-mentioned are simple routines you can use to familiarize yourself with complex gym exercises that can be considered by all levels of fitness. They workout core muscle groups that not only make for a more toned physique, but for an overall healthier physical health as well. The important thing to remember about doing any of this is to learn the proper form and to pace yourself correctly so you don’t hurt yourself in the process. If you are hitting the gym for the first time, definitely consider hopping on the stationary bike, toning your back muscles through lateral pull-downs, enhancing upper body strength with the chest press exercise, and strengthening your arms through the bicep curls. You will find that doing all these is a breeze when you take out a membership in a fitness club that has well-maintained amenities and equipment. 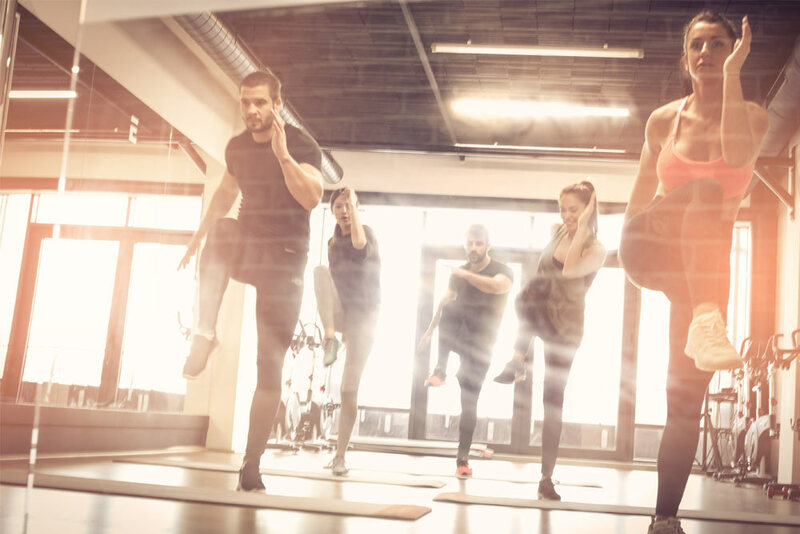 At Rec Xpress, we offer a smart-value membership fee, flexible arrangements, top-quality amenities, and a staff dedicated to helping you reach your fitness goals, so you should have no problems working towards a fitter, healthier you. We offer have deals offering between two – four weeks free when you signup online so if you’re looking for a gym with no joining fees, no processing fees and no lock in contracts then consider Rec Xpress and our five locations. Join up online and save.